Good news to all Globe Prepaid subscribers! 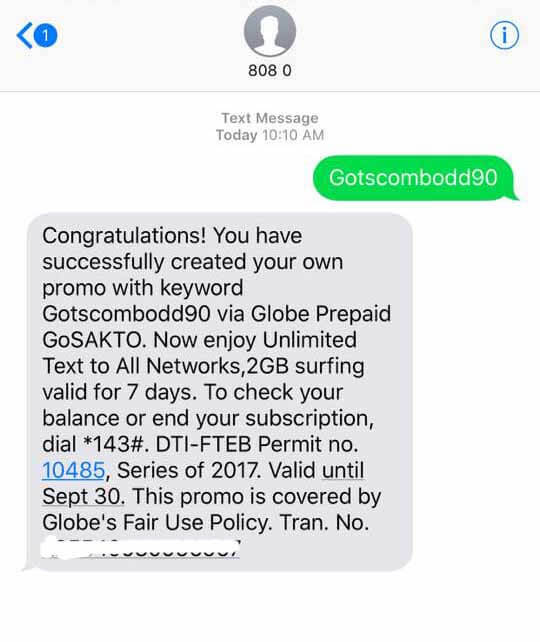 If you’re looking for cheap internet promo, try the new and improved GoSakto offer with bigger data allocation called the GOTSCOMBODD90. It gives you unlimited texts to all networks plus 2GB of mobile data for only 90 pesos. The validity is up to 7 days as long as you still have remaining data up to the expiry date. For all-net texts (Globe, TM, ABS CBN Mobile, Cherry Prepaid, Smart, TNT and Sun), it’s unli so you can enjoy it for the whole week without additional promo subscription. You have two ways to subscribe to this promo. Choose your preferred way to subscribe to this package. I would suggest to go for option 1 because it's the easiest and fastest way to register for this offer. Update: New name of this promo is GoSAKTO 90. Via Globe *143# USSD code menu. Dial *143# then select Gosakto>Create a Promo>Text and Surf>TXTS to All Networks>Unlimited TXTS>Bulk (MB) Surfing>2000MB>7 Days>Create and Subscribe. 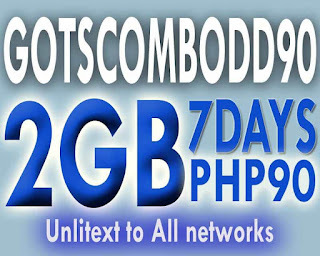 There is also GOTSCOMBODD70 with 1GB data + unlitext to all for only 70 pesos, if you don't want to add 20 pesos for another 1GB of data for internet surfing. You can use this promo to watch videos, send emails, messenger, chat, browse your social media apps and more. The important thing with this offer is you need to monitor your daily usage to make it last up to the said expiry date. Another good thing with this promo is it’s stackable. You can load the same promo again while it is still active to extend and add up another 2GB of data to your remaining data balance. 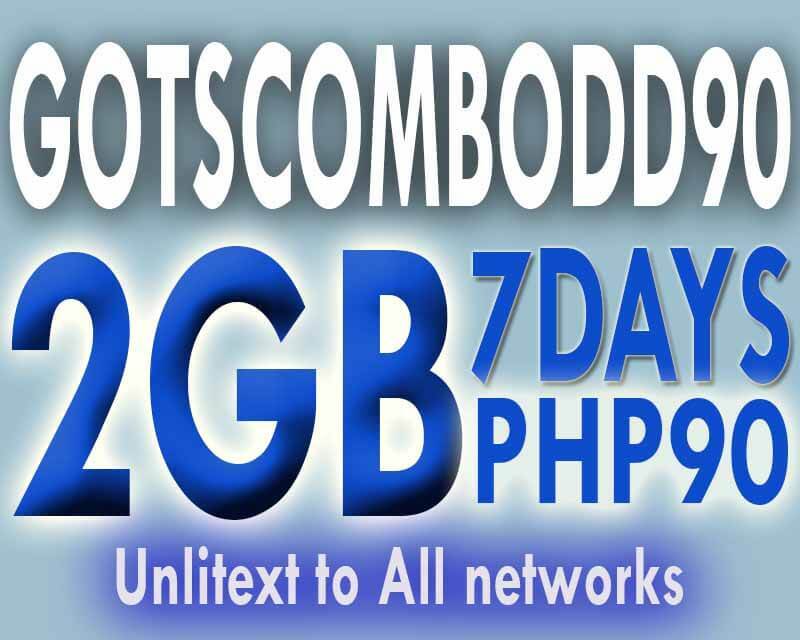 Let’s say you load GOTSCOMBODD90 5 times, it will cost you 450 pesos for 10GB or mobile data. Tip: Before you start using this promo, make sure you already receive the SMS notifications from Globe or 8080 that says something like this. If you're a frequent of this promo you have a bigger chance of enjoying Globe HACKS90 (free 7GB data for GoWATCH and 700MB for GoPLAY reward. You can also text GOSAKTO STATUS send to 8080 to check your remaining text and data balance while you subscribed to this promo. To stop, just text the keyword GOSAKTO STOP then send to 8080.
what if 1 day remaining nlng sa gotscombodd90, tapos mag register ng gotscombodd70, mag continue po ba along gotscombodd90 yung remaining ng gotscombodd90? 1 day remaining sa gotscombodd90 then nagregister ka ng gotscombodd70. Plus 1 week ulit yung unli allnet mo then yung remaining data mo madadagdag lang sa bago mong 1gb. 7 days lang po yata yan, kasi hindi po stackable yung time. Pang globe lng ba to hindi pede sa tm ?? mag iistack din ba ang days kapag 5 times ako nagregister or yung data lang? Kayacpo ba nyan 4G+ lte signal?? how to inquire remaining balance for this promo? If I'm subscribed to this then I went abroad within the 7 days, magagamit pa ba yun abroad? Can it be extended? Thanks! If i play mobile legends would it still be unli?can i still use it for 7days? Pwde po ba ito sa tm? Pano po iclaim ung free 300 mb nabura ko kasi ung txt? Pwede po ba ito sa TM network ? I registered (1st time) Gotscombodd90 with 2gb but since i consumed it for only 3 days. I loaded it again and registered again (just today). I think since i registeres the 2nd time altho the days for the 1st one has not yet ended. The new registration will follow. So its the 1st day of my 2nd registration.